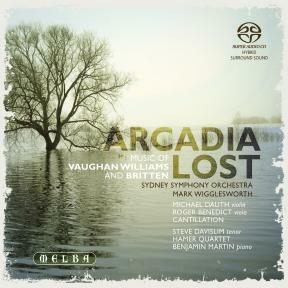 Arcadia in this recording refers to pre-World War I England, certainly a period of calm before the storm. Wigglesworth and company have programmed a selection of fairly well-known works. Ralph Vaughan Williams is represented by The Lark Ascending, Flos Campi and On Wenlock Edge (in the version for tenor, piano and string quartet). Benjamin Britten is featured with his Sinfonia da Requiem. The orchestral compositions were recorded in the Sydney Opera House, presumably the 2,679 seat Concert Hall. The results in SACD are sonically cavernous, but not to the detriment of the recording which is full and fairly clear of damaging reverb. Born in Sussex, England, Wigglesworth is an excellent conductor who brings out the best qualities of the compositions. He simply has the right feel for the music. He is fortunate to have a top-flight orchestra to work with. In The Lark Ascending, a romance for violin, Michael Dauth, the orchestra’s concertmaster, creates a ravishing and transporting lark. Vaughan Williams was inspired by a poem by George Meredith, famous in pre-1914 England. The original violin and piano version was completed in 1914 and the orchestral version followed in 1920. Roger Benedict, solo viola, and the chorus named Cantillation help create the exotic sounding Flos Campi, with its inspiration from the Song of Solomon. There is some Ravel influence (Vaughan Williams studied with him in 1908), with a wordless chorus and impressionist coloring. Vaughan Williams wrote this work in 1924-25. Purely orchestral, Britten’s 1940 Sinfonia da Requiem reflects the composer’s anti-war sentiments and is dedicated to his recently-deceased parents. Britten pulls out all the stops in this ultra-serious work. Wigglesworth and the Sydney Symphony provide all the excitement inherent in this highly accessible score. For some reason, Melba Recordings chose to record the chamber version of On Wenlock Edge, instead of the orchestral. This 1909 song-cycle for tenor, piano and string quartet has settings of six poems from A.E. Houseman’s A Shropshire Lad, a source used by other composers as well. Tenor Davislim, pianist Martin and the Hamer Quartet provide a fittingly emotional and dramatic reading. This performance was recorded in Iwaki Auditorium, a small concert hall near the Melbourne Arts Centre. No sonic complaints about this venue. The SACD’s booklet comes with French and German translations of Kennedy’s essay, the poems used in On Wenlock Edge, biographies of the major performers, a list of the orchestra players, the Melba Foundation supporters, and extensive credits for the recording. The art work, including color photographs, is stunning. This presentation is a model of what major record companies should strive for. Overall, this is a highly recommended SACD.